It's no secret that videogames are still fighting to dig themselves out of the hole once filled by comic books and rock and roll. Every day, their struggle plays out in newspaper headlines, televised debates and blog posts. Where some see an engrossing form of artistic expression, others simply see a mindless form of entertainment at best and the driving factor behind some horrendous crime at worst. Is there a link, however indirect, between violent games and aggression? We may never truly know. But, can a few all night gaming sessions with a group of friends, a couple of webcams and the eyes of the internet watching you lead to some good karma? That one's a little more obvious. On October 30, 2008, while we were busy making plans for the fright-filled night ahead, a group of Texas youngsters calling themselves The Speed Gamers were hard at work preparing for their 48-hour, horror-themed videogame marathon. The games, the participants and the equipment had to be in place before the event went live the following evening. They weren't worried, though - they had this system down to a fine art, as this was their seventh marathon to date. 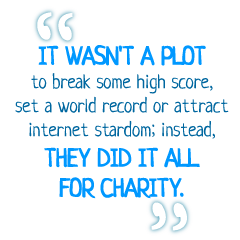 And it wasn't a plot to break some high score, set a world record or attract internet stardom; instead, they did it all for charity. St. Jude Children's Research Hospital, Child's Play and even Barack Obama's presidential campaign all have videogames - and the tireless marathon teams that play them - to thank for their help in raising both awareness and support over the past year. And while 2008 marked the rise of the gaming marathon, it all started in 2007 when the talented crew at LoadingReadyRun.com hit the road from Tucson, Arizona, to Las Vegas, Nevada, in the 2007 Desert Bus for Hope. According to the videogame marathon archival site GameMarathons.com, this was "the very first videogaming marathon ever broadcast online, and featured a game so tedious and boring that it was never released." Desert Bus for Hope, a four-and-a-half-day marathon centered on the incredibly boring mini-game Desert Bus, ended up raising over $22,000 for the Child's Play charity and drew attention from all corners of the internet. The idea took hold, and by January of the following year another marathon group, Four 48, decided to sit down and attempted to finish four Zelda titles in 48 hours. Some "technical issues" prevented the group from reaching their goal, but they still managed to raise over $1,000 for Child's Play and help lay the foundation for the way gaming marathons are practiced today.